The U.S. Naval Research Laboratory (NRL) is quietly working on technology that will let it capture solar power in orbit - and then project it back down to Earth, to specific locations where it is needed. 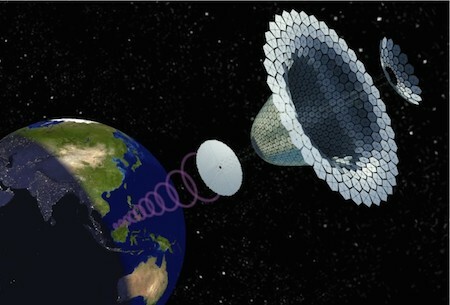 Not only would space solar potentially save the Pentagon buckets of cash, but it could simplify military deployments. Fuel tankers would no longer have to reach remote or volatile areas, and missions could run longer without having to return to base to refuel. Science fiction fans have been treated to this idea from a variety of writers - we've been waiting for it to become reality for a long time! Isaac Asimov's 1941 short story Reason described a solar station which beamed energy around the solar system. However, I think Clifford Simak was earlier (by about one month!) with his Solar Energy Beam from his 1941 short story Masquerade.